LANSING, Mich. — New Michigan Gov. 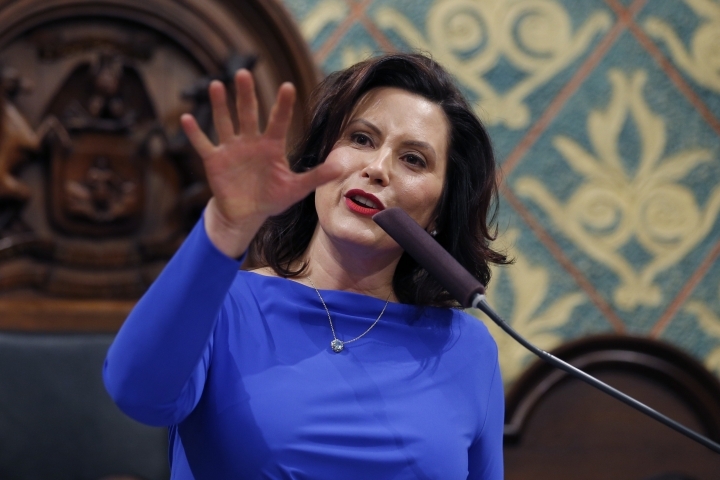 Gretchen Whitmer, who campaigned on a bold promise to "fix the damn roads" in the capital of the U.S. auto industry, will propose nearly tripling the state's per-gallon fuel tax, her office said Monday. The Democrat's budget proposal, which will be a tough sell in the Republican-led Legislature, would boost the 26-cent gasoline and diesel tax by 45 cents by October 2020. The tax hikes would coincide with relief "to help offset the cost to people's pocketbooks," which Whitmer will discuss further when she presents her spending plan Tuesday, said spokeswoman Tiffany Brown. Whitmer also will outline a proposed $500 million increase to state K-12 classroom spending, including a $180 boost in the minimum per-student grant and substantial funding hikes to teach low-income, vocational and special education students. She wants to boost the 26-cent gasoline and diesel taxes by 15 cents in October, an additional 15 cents in April 2020 and 15 more cents in October 2020. That would generate an additional $2 billion annually. She has said drivers already are paying a "road tax" because Michigan's pothole-ridden roadways are forcing them to pay hundreds of dollars a year on vehicle repairs. A top GOP lawmaker, Senate Majority Leader Mike Shirkey, did not rule out a tax hike to better fund roads and bridges but said his initial priority is lowering the high cost of car insurance in the state. "He'd first like the governor to work with him and his caucus to save families money by reforming car insurance," said spokeswoman Amber McCann. "Then he would entertain having a discussion about new revenue for roads." Higher fuel and vehicle registration fees took effect two years ago as part of Republican-enacted laws to gradually pump $1.2 billion more annually into transportation — following a failed legislator-proposed ballot initiative — but many agree it is not enough new spending. Four former legislative leaders from both parties have said fuel taxes should be increased by 47 cents over nine years. Business Leaders for Michigan, a group of the state's top executives, on Monday urged legislators to act. President and CEO Doug Rothwell stopped short of backing a specific proposal but said the roads "are an embarrassment," are getting worse and becoming more expensive to fix. "We are not an organization ... that likes to talk about raising taxes, and we don't take that lightly at all," he said. "But we're on record saying that we need to make a significant increase in investment in our infrastructure, and that we believe user fees — which could be a gas tax — is the best and fairest way to do it." The state Republican Party criticized Whitmer, however, saying her proposal would "break many Michiganders' budgets." Michigan drivers pay some of the country's highest taxes at the pump, but not all of the revenue goes to the transportation budget. The sales tax on fuel mostly goes to schools and local governments under the state constitution. Whitmer also will call for new "weighted" K-12 funding formula to factor in higher costs for certain students, according to details first reported by The Associated Press. The plan includes $235 million in additional base aid — a 2.5 percent bump — along with $120 million more for special education, an extra $102 million for economically disadvantaged and other at-risk students, and $50 million more for career and technical education students. Whitmer's administration is billing it as the largest increase in classroom spending in 18 years, if state payments for retirement costs are not counted. It was not immediately clear how she will propose paying for the plan, though she has previously called for stopping the practice of shifting K-12 funds to universities and community colleges. The minimum per-student allowance — which most districts receive, including charters — would increase from $7, 871 to $8,051, a $180 increase. Districts at the higher end would get $8,529, or $120 more than the current $8,409 allotment. Her plan was applauded by the Michigan Education Association, the state's largest teachers union, which called it a "huge step" toward addressing how education has become underfunded over decades . "It doesn't cost the same amount of money to educate every student, and this budget proposal reflects that reality," said president Paula Herbart. "Additional funding for at-risk, special education and career/technical education puts additional funds where they're needed most to help all students achieve."